Yes, Mastodon is decentralised, but in some sense it's not a single thing. Here is a way of thinking about it. Imagine running your own version of Twitter. People register with it, people tweet on it, and everyone can see what everyone says. After a while you want to be able to follow just some people, so you set up the concept of "follow", and have two columns. The first is for things you say, and things that are said by the people you follow. The second is for a chronological time-line of all the tweets. Actually, this is now a little different from Twitter, so let's not call them "tweets", let's call them squeaks. If it's your version of Twitter, surely only your friends/people with similar interests will register, so why would there need to be a separate columns for people you follow? Any given person has several interests, so perhaps I find that in general person A talks about stuff I'm interested in, but person B is, for me, generally even more interesting. So there's the "flood" of all the squeaks, but there is also a curated time-line of those squeaks from people I personally know, or who are particularly interesting (to me). Other people on this instance might be interested in the same "flood", but have other specific people they want to pay more particular attention to. As the community grows, this will become even more important. Or is like a regular friends and a favourites column effectively? You could think if it like that. But if you want this sort of thing to be popular and useful, you do need to allow people other than your immediate friends to register. Their friends might/will also want to join, and you might not want to follow them. And would I, a regular user, have to register on multiple versions and tweet/squeak separately on each of them? That's where the "Federation" idea comes in, and that's explained further down. So it's going well, but it's quite small. But actually that's OK, because you know that people in general don't say anything interesting. More, your instance of this Bird-thing replacement has a good community feel, and most of the people on it have quite a lot in common. However, you notice that there are other people also running the same software that you are, and some people on those instances are saying some interesting things. But not all of them. So what you do is create the facility for people on your instance to follow people on other instances. Anything said by people "over there" followed by people here are copied here into that third column. So the third column has the squeaks of people in other places, provided there is a reason to believe they might be interesting. That reason is given by someone here following them. So this is like when Twitter tells me a bunch of people I follow are all tweeting about the same thing or have all liked a picture or something? Not really, no. This is where you get to see the things other people on this instance think are interesting. This gives you the possibility of discovering other people on other instances, people who are effectively implicitly recommended by the people in your community. OK, so the obvious question is: Why is this better than Twitter? Firstly, it's open source, and not controlled by a company that has to make money from it. As a result, no ads. Further, the fact that it's got many, many instances means that if one starts to use ads, people will probably migrate to another. That's a good question. Currently I'm following people who boost tweets from others, so I end up following people on other instances because of toots I've seen. Secondly, it's distributed, in the sense that there are now dozens of instances, so if one dies it only affects the people who were on it. There is nothing stopping instances from dying, but one would expect that over time some will prove to be long lasting and robust. I also expect that very soon now there will be tools for exporting your data in a form that can be re-imported into another instance. I expect people will regularly backup their data - it might even be automated - and then if an instance dies they can move. 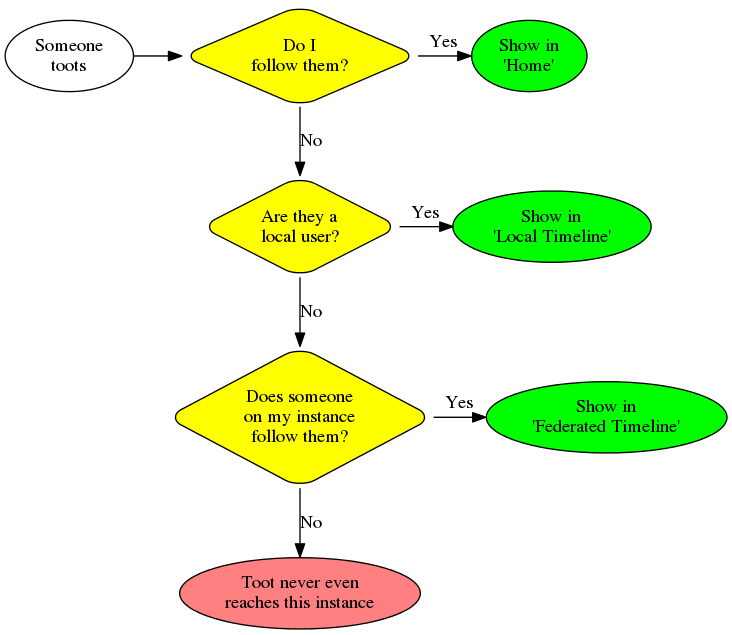 Thirdly, if an instance is "acquired" by a company, the same migration tools will let people move off it to another, so that removes the incentive for a company to buy an instance and drive it according to principles people don't like. Funding so far is personal - some of the admins have patreon accounts, and users are donating. Fourthly, Twitter has been messing about with how replies work, and with messing up the chronological nature of the stream. Mastodon is as far as possible adhering to the time-line. It's unlikely that a new Twitter front-end could fix this, as Twitter has been pretty aggressive about shutting down systems/tools that don't adhere to what twitter wants in the way of presentation. More recently, people are becoming reluctant to write things to work with the Twitter system because the big T is changing things that break third-party systems. Of course, this might not be the Twitter killer, but Mastodon has been gaining users quickly over the past few weeks, very quickly in the past week, and it may have gained critical mass among techies. If so, it may be made accessible for muggles, and then we can see what might happen. Twitter might not die, but the more sensible people might move to Mastodon and leave the screaming rabble behind. 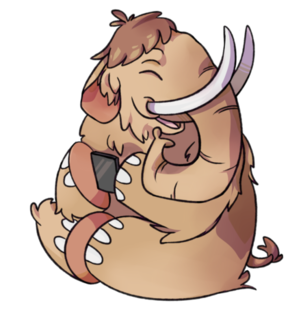 The idea of Mastodon being small communities that cross-connect in a limited way might prevent the big ball of mud that Twitter has become. Perhaps a little like local social clubs which are part of an umbrella organisation. There are already external tools to cross-post between Twiter and Mastodon, they may increase and become accessible to muggles, which will help the migration. The fear is that if/when Mastodon gets any kind of wider exposure, the screaming rabble will come. That may be true, so it may be that we will have to rely on strong moderation on small instances. Only time will tell. What is certain is that it's still growing.